The party on the other end of the phone conversation is an adult to whom you psychologically owe attention, but unlike the adult passenger, has no idea of what you are seeing through the windshield. 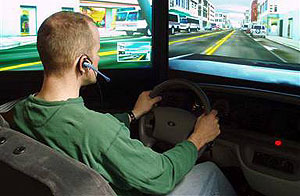 A passenger will subconsciously stop talking if something untoward or just complicated is unfolding on the road ahead, and will expect you to suspend the conversation similarly, so she causes no important distraction at the critical moments when you need to be driving on all neurons, and you are aware of all this. In contrast, the person on the phone can’t do either of these things, and you are aware of that as well. When you need to navigate a tricky bit of road, there’s no time to ask someone to be quiet, and telling a peer to shut up for a minute, in any terms, is so rude that it absolutely requires an excuse that makes it take even longer (“can you hold on for a minute? one of the kids is playing with my blunderbuss and I think it’s loaded”). This strikes me as plausible. As another possibility, I’d add that (for reasons that escape me) people seem to be more excitable talking on the phone than in person. I’m not sure why, but maybe it has to with the nature of not having a face in front of you and not getting any nonverbal feedback. Any other ideas? In the meantime, stop talking on your cell phone when you drive. And stop texting too. Just stop. Your signal breaks up a lot and it’s hard to have a decent conversation anyway. So just stop.